The Scotch, or Scots, Pine (Pinus sylvestris L.) is extremely popular in the United States for Christmas trees, but despite the wide range of places they are grown in the US, they are not native to our land. The tree species was originally introduced by European settlers and is native to Europe and parts of Asia. Although it grows well in the United States, it fairs much better in its natural habitat. In Europe and some countries in Asia, the species has a high economic value, used to produce pulpwood, poles, and sawlogs. It is also used in veneer and in manufacturing plywood. It’s used ornamentally within landscaping in parks and gardens. In its natural state, the trunk can grow to be up to 30 inches in diameter and up to 125 feet tall. However, in the United States, the Scotch pine is primarily used for Christmas trees, so the trees rarely reach a very tall height. They are not used for lumber and other manufacturing quite like they are used in Europe. It takes 6-8 years to produce a 7-8 foot tree. Scotch Pines are extremely adaptable to a wide variety of soils. It can even survive in the Verkhoyansk Mountains of eastern Siberia where winter temperature lows are at -64° C (-83° F). Needle retention is great for lasting through the season because if the tree dries out, the needles still don’t drop. Needles are in bundles of 2 at about 1-3 inches long depending on the variety. Some Scotch Pines are a bright green while others are a dark green with a hint of bluish-green. The bark is a reddish-orange color, particularly in the more mature trees. Diversity within the Scotch pine is great including geographic varieties somewhere between 19 and 22. At Christmas Farms, the Scotch pine ends up being about 20% of the Christmas trees we sell (out of 8 options)—so it’s still pretty popular. 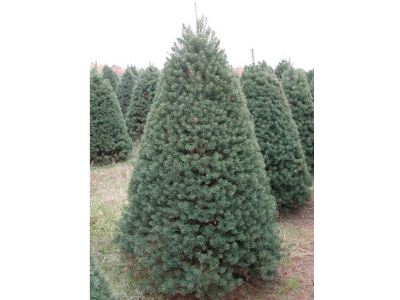 We also grow Fraser Firs, Balsam Firs, Canaan Firs, Douglas Firs, Concolor Firs, Blue Spruce, and White Pine and have free delivery on the day you pick to all over the US (excluding Hawaii and Alaska). Christmas may still be a ways away, but it’s never too early to start dreaming about it. Next season when you’re ready to pick out your tree, buy a wreath or other hangings for your house, or find a gift for a boss or coworker, keep Christmas Farms in mind.